How can homes be more efficent through energy recapture? How Can Houses Be More Efficient Through Energy Recapture? 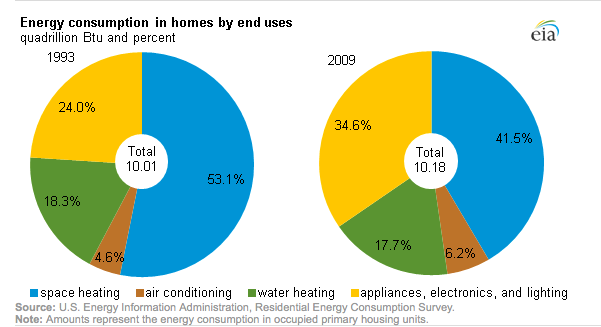 Obviously, heating and cooling is two-thirds of all energy use, so home insulation is hugely important. It’s better to not waste energy than to recapture wasted energy. So that’s the first place to start. An important point to make here is that almost all “appliance, electronics, and lighting” energy use turns into heat after the appliance is done with it. Your oven heats your house while cooking food, and light bulbs heat your house while making light. Vacuum cleaner? Heats your house. All really stupid ideas. Don’t bother with little stuff like this. It doesn’t pay off. So the question of home energy reuse really boils down to: How do I make heating/cooling flows pay double dividends or avoid using double energy? Perfect example of paying for the same thing twice: air conditioning. The average U.S. household consumes an average of 450 watts of electricity on “appliances, electronics, and lighting” at all times. Your appliances, in aggregate, are the equivalent of a space heater set on “low.” And your water heater puts off heat directly and throughout your walls by way of the plumbing. All that heat has to be removed from your home by your air conditioner. That’s a classic example of paying twice. Figuring out a way to route that heat directly outside (bypassing the AC) or toward something useful would save a lot of energy. An example might include using a central vacuum system that routes hot exhaust air outside. Or perhaps running the feed inlet to your water heater through a heat exchanger tied to your refrigerator coils. Send the appliance heat directly where you want it. Likewise, the AC pushes a lot of heat outside your house. But your water heater needs heat, year-round. A hybrid air conditioner/water heater unit will make hot water while it cools your house! Double dividend. This is a real thing you can buy. Managing the air conditioning can reuse or save a lot of energy. On the other hand, in winter, maybe you want all that appliance-generated heat. You’re already paying to run the appliances, so the heat is effectively free. So you don’t always want the heat to go outside. In that case, the heat isn’t wasted—it’s working for you twice. There are other possible ideas. But all major residential energy reuse opportunities revolve around heat-flow management. Everything else is pretty trivial compared to heating and cooling. How hard is it to add solar power capabilities to a Tesla?